Film directors Zhang Yimou, left, and Ang Lee talk to an audience of film students and members of the Chinese-language press at Cooper Union in New York last night. Zhang is the director of the forthcoming film about the Cultural Revolution, <em>Coming Home</em>. 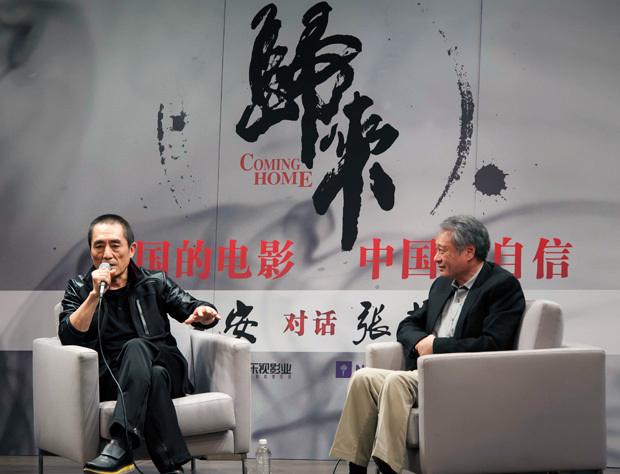 Ang Lee, the Oscar-winning American film director with Taiwan roots, and Zhang Yimou, the storied veteran of mainland Chinese moviemaking, joined together on March 27 at Cooper Union in New York in a discussion billed “Chinese Film, Chinese Confidence” by Zhang’s backer, LeVision Pictures. Lee’s is a household name around the world among fans of his Hollywood blockbuster Life of Pi, an exploration of man’s relationship to faith. Zhang, on the other hand, might be more widely remembered these days for his design of the opening and closing ceremonies of the Beijing Olympics in 2008 than for any of his films. Sure, true world cineastes revere him for his groundbreaking works of the late 1980s and early 1990s (e.g., Red Sorghum, Raise the Red Lantern). But his last film, The Flowers of War, barely registered in North America, still the world’s largest movie marketplace in gross sales terms ($10.92 billion in 2013), despite a starring role for Oscar-winner Christian Bale. With China’s box office up 27.5 percent in 2013 to $3.5 billion, according to the State Administration of Press, Publications, Radio, Film, and Television, and expected to overtake North America’s in five years, Zhang is at once trying to gain a footing in Hollywood as China's most entrenched director and trying to avoid being left behind by his home audience. Now decades his junior, Chinese moviegoers helped crown the 2012 comedic road movie Lost in Thailand, by first-time director Xu Zheng, the most successful Chinese-language movie of all time. At the same time as Zhang is coming West—as the most visible example of the central government’s call to use the media to promote China’s image to the world—the Hollywood studios are headed East, promoting the best calling cards the American Dream ever knew: blockbuster movies. The cast of Spiderman 2 was on a junket in China just this week. Hollywood is ramping up its efforts to engage the interest of younger, more affluent Chinese moviegoers, whose swelling ranks now spend more on movie tickets each year than any other audience in the world after North Americans. And Zhang wants America’s attention. He is in talks to direct an English-language co-production in Hollywood about the Great Wall of China —an experiment in trying to please two markets at once. Zhang said he was looking to Lee for advice to spread his message in a tongue he does not speak. “Ang Lee occupies both worlds, so I want to learn from him,” Zhang said. “We are proud to see him represent Chinese in Hollywood,” a place he acknowledged might have something to offer China. The evening’s moderator, New York University film professor Christine Choy, asked Lee how he makes movies for the world and he was forthcoming with his answer. With China’s new economic power and political confidence, Zhang predicted it wouldn’t be six years before China’s box office becomes number one worldwide. “The whole industry will lean toward China,” he said. That day may come, but the mounting costs of the breakneck development of China’s movie industry infrastructure—its theaters and its studios, for instance—add increased real-time pressure on China’s few marquee directors like Zhang to turn a big profit now. Lee touted the wisdom of a long-term strategy. Both Zhang and Lee said they put little time into the Hollywood practice of reworking scripts to try to achieve what market analysts say could result in the greatest commercial success at any given moment. One young male student at NYU—where Zhang’s daughter also studied filmmaking—asked Lee and Zhang what role awards should play in a director’s life. The directors’ discussion was hosted by NYU and LeVision, the private Beijing-based company where Zhang was named Creative Director in 2013. A room of about one hundred mostly-Chinese and Asian American guests gathered in the Frederic Rose Theater in the basement of a late-model frosted glass and steel building on Cooper Square. Reporters not with the Chinese media were invited by LeVision on the condition that they not write about Coming Home, Zhang’s new film about the Cultural Revolution. For the dozens of Chinese reporters in the room in both print and broadcast media, the directors were preceded to the stage by a montage of their best known Chinese-language films, titles such as Lee’s Crouching Tiger, Hidden Dragon, the highest-grossing foreign language film ever to screen in North America (box office total in 2000, $128 million), and Zhang’s Hero, the third-highest grossing ($53 million in 2002). Between the movie clips, word-pairings in Chinese characters and English translations—“Broad / Profound,” “Expansive/Majestic,” “Vigorous/Serene,” and “Tranquil/Dynamic”’—flashed across the screen. A LeVision representative said the trip was designed to get Coming Home press attention back in China in the run up to its premiere around the May 1 Labor Day national holiday, a peak moviegoing time. The two casually-dressed directors, Zhang is his typical all-black, down to his sneakers, and Lee in khakis and a blazer, were seated in front of towering advertising posterboards for the drama about a woman writer’s experience during the tumultuous time of the 1960s and 1970s when the politics of paranoia ruined many lives. It is a period only just beginning to be readdressed in the popular conscience today. Zhang’s Hero and Lee’s Crouching Tiger for years set the standard against which many Chinese language films were judged. Both films’ commercial success spawned countless imitators and over a decade of historical martial arts epics of which today’s audience has grown tired. Younger directors are serving up romantic comedies and contemporary action films, but there still are few films shot in Chinese and given official approval for theatrical release that deal with the country’s vision for its future. “I won’t restrict myself to the past,” Zhang said. “I will make films about the future. Today, very few films in China are filled with fantasy and imagination.” Pinpointing one reason why that might be the case, one audience member asked when Zhang had made compromises in his work.